New York Times bestselling author Jennifer Ashley has more than 100 published novellas and novels in romance, mystery, and urban fantasy. She also writes as Ashley Gardner and Allyson James. Tiger is my favorite character. He is off to rescue an unknown person. I couldn’t put the story down. Leaves you wanting more! 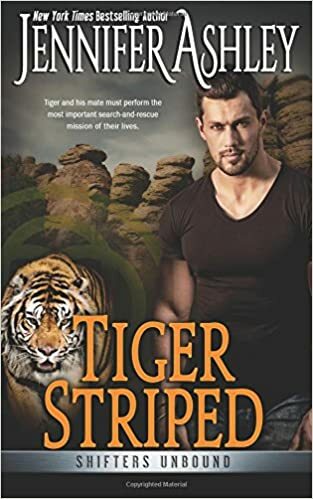 3.75 stars– TIGER STRIPED by Jennifer Ashley is instalment 11.5 and novella in the author’s contemporary, adult SHIFTERS UNBOUND paranormal/fantasy romance series and follows Tiger, a lab-created shifter, and his mate Carly, previously introduced in TIGER MAGIC #5 as they go in search for a part of Tiger’s past. SOME BACKGROUND: Thousands of years in the past, the Fae created the shifters-a cross between beast and man-and in the ensuing time the Fae lost control and power over the battle creatures they had created for war. Approximately twenty years ago shifters were exposed to the human population. Out of fear, discrimination and specieism, the shifters were collared with Fae magic in the belief that it would control aggression; then they were forced into segregated communities known as Shiftertowns. There are several Shiftertowns located throughout America where shifters live in a relative but strained peace amongst their own kind. Told from dual third person points of view (Tiger and Carly) TIGER STRIPED follows Tiger as he goes in search of someone or something. Awakened in the middle of the night by a psychic distress call; an unknown force he is unable to explain, Tiger does not hesitate to leave the warmth of his marital bed to hunt for the unknown. Not wanting her mate to walk into a trap, Carly does what come naturally and goes along with Tiger as he journeys towards the unknown. Along with Connor Morrisey, a young lion shifter who has stowed away in the back of his uncle’s truck, our trio crosses state lines, and risks reprisals from the Shifter Bureau, as Tiger continues to focus on his end goal. What ensues is a dramatic car chase with a darkened SUV, and a number of uniformed enforcers trying to protect what Tiger hopes to unleash. TIGER STRIPED is a very quick read; a short story that reveals a little bit of Tiger’s past, and the ramifications of a controlled experiment that went horribly wrong. There is a little bit of everything: action, suspense, romance, betrayal and love. TIGER STRIPED is a must read for fans of Jennifer Ashley’s SHIFTERS UNBOUND.